In Italy, farro is a popular grain used in salads, soups, as a grain side dish, or even in place of rice in risotto dishes. It has a slightly nutty taste and if cooked properly should be just tender to the bite. Best of all, farro is high in fiber, magnesium and a number of important vitamins. Farro goes well with many different vegetables, meat and poultry, and it’s possible uses are endless. In this soup recipe it adds a depth of flavor and hearty texture that is very satisfying. Farro is becoming much more popular worldwide, but if it is very difficult to find in your area, feel free to substitute barley. The fava bean season in Italy is short, so while they are still plentiful at our local farmer’s markets, I buy them often and use them in a myriad of ways including as the star ingredient in soups such as this one. 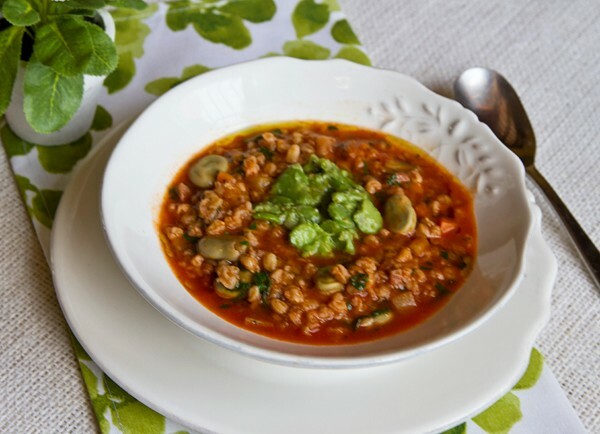 I like to make healthy vegetable and grain based soups to store in my freezer to enjoy as quick lunches during the summer when we are busy overseeing our farmhouse guests, or busy keeping up the extensive landscaping on our property. During the warmer months, I serve these types of soups just barely warm with a drizzle of our own olive oil on top. Optional: Turkey sausage is also a great addition to this soup and can help make a bowl of soup a complete meal. To add sausage, simply take two or three sausage links (depending on size), and remove the meat from the casing. Sauté the meat along with the onions, celery, and carrots, breaking it up into small pieces as it cooks. Farro is high in fiber, magnesium, and vitamins A,B,C, and E.
Olive oil is the chosen oil, which is a heart healthy mono-unsaturated oil with good antioxidant properties. Fava beans are a good food source of vitamin B1 or thiamin, iron, copper, phosphorus, potassium and magnesium, meeting 10 to 19 percent of the recommended daily value, for each per 1/4 cup. Also high in fiber & dietary protein, fava beans are a nutrient packed powerhouse! A hearty bowl of soup packed full of nutrients that is delicious too! In a large heavy saucepan, heat the olive oil and then add the carrots, celery, onions, and garlic. Sauté until tender over medium heat, about 8 to 10 minutes. Add the tomatoes, farro, dried oregano and broth. Season with salt and pepper and bring to a boil. Reduce the heat, and simmer everything over low heat until the farro becomes tender, adding a cup or two of water as needed if the soup becomes too thick. 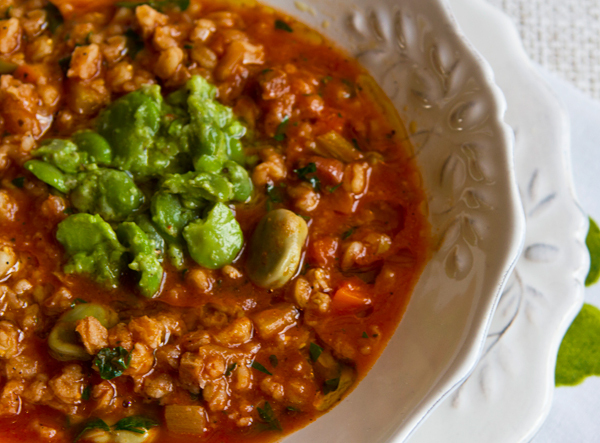 After 10 minutes of cooking time, add the fava beans and the chopped parsley to the pot. The farro should be tender to the bite but not mushy, which takes between 20 to 25 minutes of cooking over low heat. Taste the soup, and adjust the seasonings as needed. Serve in individual bowls, using your garnish of choice.